Edom (/ˈiːdəm/; Edomite: 𐤀𐤃𐤌 ’Edām; Hebrew: אֱדוֹם ʼÉḏōm, lit. : "red"; Akkadian: 𒌑𒁺𒈠𒀀𒀀 Uduma; Syriac: ܐܕܘܡ‎) was an ancient kingdom in Transjordan located between Moab to the northeast, the Arabah to the west and the Arabian Desert to the south and east. Most of its former territory is now divided between Israel and Jordan. Edom appears in written sources relating to the late Bronze Age and to the Iron Age in the Levant, such as the Hebrew Bible and Egyptian and Mesopotamian records. In classical antiquity, the cognate name Idumea was used for a smaller area in the same general region. The Hebrew word Edom means "red", and is derived from the name of its founder, Esau, the elder son of the Hebrew patriarch Isaac, because he was born "red all over". As a young adult, he sold his birthright to his brother Jacob for "red pottage". The Tanakh describes the Edomites as descendants of Esau. The name 'Iduma' which was translated into "Edom"
The Edomites may have been connected with the Shasu and Shutu, nomadic raiders mentioned in Egyptian sources. Indeed, a letter from an Egyptian scribe at a border fortress in the Wadi Tumilat during the reign of Merneptah reports movement of nomadic "shasu-tribes of Edom" to watering holes in Egyptian territory. The earliest Iron Age settlements—possibly copper mining camps—date to the 9th century BC. Settlement intensified by the late 8th century BC and the main sites so far excavated have been dated between the 8th and 6th centuries BC. The last unambiguous reference to Edom is an Assyrian inscription of 667 BC; it has thus been unclear when, how and why Edom ceased to exist as a state, although many scholars point to scriptural references in the Bible, specifically the historical Book of Obadiah, to explain this fact. Edom is mentioned in Assyrian cuneiform inscriptions in the form "Udumi" (𒌑𒁺𒈪) or "Udumu" (𒌑𒁺𒈬); three of its kings are known from the same source: Ḳaus-malaka at the time of Tiglath-pileser III (c. 745 BC), Malik-rammu at the time of Sennacherib (c. 705 BC), and Ḳaus-gabri at the time of Esarhaddon (c. 680 BC). According to the Egyptian inscriptions, the "Aduma" at times extended their possessions to the borders of Egypt. After the conquest of Judah by the Babylonians, Edomites settled in the region of Hebron. They prospered in this new country, called by the Greeks and Romans "Idumaea" or "Idumea", for more than four centuries. Strabo, writing around the time of Jesus, held that the Idumaeans, whom he identified as of Nabataean origin, constituted the majority of the population of Western Judea, where they commingled with the Judaeans and adopted their customs. A view shared also by some modern scholarly works which consider Idumaeans as of Arab or Nabataean origins. The Edomites' original country, according to the Hebrew Bible, stretched from the Sinai peninsula as far as Kadesh Barnea. Southward it reached as far as Eilat, which was the seaport of Edom. On the north of Edom was the territory of Moab. The boundary between Moab and Edom was the Wadi Zered. The ancient capital of Edom was Bozrah. According to Genesis, Esau's descendants settled in this land after displacing the Horites. It was also called the land of Seir; Mount Seir appears to have been strongly identified with them and may have been a cultic site. In the time of Amaziah (838 BC), Selah (Petra) was its principal stronghold, Eilat and Ezion-geber its seaports. These are the kings who ruled in the land of Edom before a king ruled the children of Israel. And Bela ben Beor ruled in Edom, and the name of his city was Dinhabah. And Bela died, and Jobab ben Zerah from Bozrah ruled in his place. And Jobab died, and Husham of the land of Temani ruled in his place. And Husham died, and Hadad ben Bedad, who struck Midian in the field of Moab, ruled in his place, and the name of his city was Avith. And Hadad died, and Samlah of Masrekah ruled in his place. And Samlah died, and Saul of Rehoboth on the river ruled in his place. And Saul died, and Baal-hanan ben Achbor ruled in his place. And Baal-hanan ben Achbor died, and Hadar ruled in his place, and the name of his city was Pau, and his wife's name was Mehetabel bat Matred bat Mezahab. And these are the names of the clans of Esau by their families, by their places, by their names: clan Timnah, clan Alvah, clan Jetheth, clan Aholibamah, clan Elah, clan Pinon, clan Kenaz, clan Teman, clan Mibzar, clan Magdiel, clan Iram. The Hebrew word translated as leader of a clan is aluf, used solely to describe the Dukes of Edom and Moab, in the first five books of Moses. However beginning in the books of the later prophets the word is used to describe Judean generals, for example, in the prophecies of Zachariah twice (9:7, 12:5–6) it had evolved to describe Jewish captains, the word also is used multiple times as a general term for teacher or guide for example in Psalm 55:13. Aluph as it is used to denote teach or guide from the Edomite word for Duke is used 69 times in the Tanakh. If the account may be taken at face value, the kingship of Edom was, at least in early times, not hereditary, perhaps elective. The first book of Chronicles mentions both a king and chieftains. Moses and the Israelite people twice appealed to their common ancestry and asked the king of Edom for passage through his land, along the "King's Highway", on their way to Canaan, but the king refused permission. Accordingly, they detoured around the country because of his show of force or because God ordered them to do so rather than wage war. The King of Edom did not attack the Israelites, though he prepared to resist aggression. Nothing further is recorded of the Edomites in the Tanakh until their defeat by King Saul of Israel in the late 11th century BC. Forty years later King David and his general Joab defeated the Edomites in the "Valley of Salt", (probably near the Dead Sea). An Edomite prince named Hadad escaped and fled to Egypt, and after David's death returned and tried to start a rebellion, but failed and went to Syria (Aramea). From that time Edom remained a vassal of Israel. David placed over the Edomites Israelite governors or prefects, and this form of government seems to have continued under Solomon. 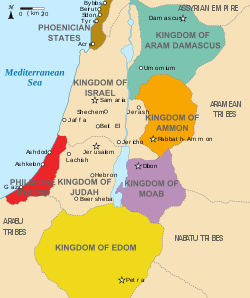 When Israel divided into two kingdoms Edom became a dependency of the Kingdom of Judah. In the time of Jehoshaphat (c. 914 BC) the Tanakh mentions a king of Edom, who was probably an Israelite appointed by the King of Judah. It also states that the inhabitants of Mount Seir invaded Judea in conjunction with Ammon and Moab, and that the invaders turned against one another and were all destroyed. Edom revolted against Jehoram and elected a king of its own. Amaziah attacked and defeated the Edomites, seizing Selah, but the Israelites never subdued Edom completely. In the time of Nebuchadnezzar II the Edomites helped plunder Jerusalem and slaughter the Judaeans. For this reason the prophets denounced Edom violently. Although the Idumaeans controlled the lands to the east and south of the Dead Sea, their peoples were held in contempt by the Israelites. Hence the Book of Psalms says "Moab is my washpot: over Edom will I cast out my shoe." According to the Torah, the congregation could not receive descendants of a marriage between an Israelite and an Edomite until the fourth generation. This law was a subject of controversy between Shimon ben Yohai, who said it applied only to male descendants, and other Tannaim, who said female descendants were also excluded for four generations. From these, some early conversion laws in halacha were derived. During the revolt of the Maccabees against the Seleucid kingdom (early 2nd century BE), II Maccabees refers to a Seleucid general named Gorgias as "Governor of Idumaea"; whether he was a Greek or a Hellenized Edomite is unknown. Some scholars maintain that the reference to Idumaea in that passage is an error altogether. Judas Maccabeus conquered their territory for a time around 163 BC. They were again subdued by John Hyrcanus (c. 125 BC), who forcibly converted them, among others, to Judaism, and incorporated them into the Jewish nation. Antipater the Idumaean, the progenitor of the Herodian Dynasty along with Judean progenitors, that ruled Judea after the Roman conquest, was of mixed Edomite/Judean origin. Under Herod the Great, the Idumaea province was ruled for him by a series of governors, among whom were his brother Joseph ben Antipater, and his brother-in-law Costobarus. Josephus, when referring to Upper Idumaea, speaks of towns and villages immediately to the south and south-west of Jerusalem, such as Hebron (Antiq. 12.8.6,Wars 4.9.7), Halhul, in Greek called Alurus (Wars 4.9.6), Bethsura (Antiq. 12.9.4), Marissa (Antiq. 13.9.1, Wars 1.2.5), Dura (Adorayim) (Antiq. 13.9.1, Wars 1.2.5), Caphethra (Wars 4.9.9), Bethletephon (Wars 4.8.1), and Tekoa (Wars 4.9.5). It is presumed that the Idumaean nation, by the 1st-century CE, had migrated northwards from places formerly held by them in the south during the time of Joshua. By 66 CE, a civil war in Judea during the First Jewish–Roman War, when Simon bar Giora attacked the Jewish converts of Upper Idumea, brought near complete destruction to the surrounding villages and countryside in that region. The Gospel of Mark includes Idumea, along with Judea, Jerusalem, Tyre, Sidon and lands east of the Jordan as the communities from which the disciples of Jesus were drawn. According to Josephus, during the siege of Jerusalem in 70 CE by Titus, 20,000 Idumaeans, under the leadership of John, Simeon, Phinehas, and Jacob, helped the Zealots fight for independence from Rome, who were besieged in the Temple. After the Jewish Wars, the Idumaean people are no longer mentioned in history, though the geographical region of "Idumea" is still referred to at the time of Jerome. The nature of Edomite religion is largely unknown before their conversion to Judaism by the Hasmoneans. Epigraphical evidence suggests that the national god of Edom was Qaus (קוס) (also known as 'Qaush', 'Kaush', 'Kaus', 'Kos' or 'Qaws'), since Qaus is invoked in the blessing formula in letters and appear in personal names found in ancient Edom. As close relatives of other Levantine Semites, they may have worshiped such gods as El, Baal, Qaus and Asherah. The oldest biblical traditions place Yahweh as the deity of southern Edom, and may have originated in "Edom/Seir/Teman/Sinai" before being adopted in Israel and Judah. There is a Jewish tradition stemming from the Talmud, that the descendants of Esau would eventually become the Romans, and to a larger extent, all Europeans. In Antiquities of the Jews, Book 15, chapter 7, section 9, Josephus states that Costobarus, appointed by Herod to be governor of Idumea and Gaza, was descended from the priests of "the Koze, whom the Idumeans had formerly served as a god." For an archaeological text that may well be Edomite, reflecting on the language, literature, and religion of Edom, see Victor Sasson, "An Edomite Joban Text, with a Biblical Joban Parallel", Zeitschrift fur die Alttestamentliche Wissenschaft 117 (Berlin 2006), 601–615. The Kingdom of Edom drew much of its livelihood from the caravan trade between Egypt, the Levant, Mesopotamia, and southern Arabia, along the Incense Route. Astride the King's Highway, the Edomites were one of several states in the region for whom trade was vital due to the scarcity of arable land. It is also said that sea routes traded as far away as India, with ships leaving from the port of Ezion-Geber. Edom's location on the southern highlands left it with only a small strip of land that received sufficient rain for farming. Edom probably exported salt and balsam (used for perfume and temple incense in the ancient world) from the Dead Sea region. Khirbat en-Nahas is a large-scale copper-mining site excavated by archaeologist Thomas Levy in what is now southern Jordan. The scale of tenth-century mining on the site is regarded as evidence of a strong, centralized 10th century BC Edomite kingdom. ^ "Edom". Random House Webster's Unabridged Dictionary. ^ a b c d e Avraham Negev; Shimon Gibson (2001). Edom; Edomites. Archaeological Encyclopedia of the Holy Land. New York and London: Continuum. pp. 149–150. ISBN 0-8264-1316-1. ^ Prof. Itzhaq Beit-Arieh (December 1996). "Edomites Advance into Judah". Biblical Archaeology Review. Retrieved 8 December 2015. ^ Jan Gunneweg; Th. Beier; U. Diehl; D. Lambrecht; H. Mommsen (August 1991). "'Edomite', 'Negbite'and 'Midianite' pottery from the Negev desert and Jordan: instrumental neutron activation analysis results". Archaeometry. Oxford, UK: Oxford University. 33 (2): 239–253. doi:10.1111/j.1475-4754.1991.tb00701.x. Retrieved 8 December 2015. ^ Avraham Negev; Shimon Gibson (2001). Idumea. Archaeological Encyclopedia of the Holy Land. New York and London: Continuum. pp. 239–240. ISBN 0-8264-1316-1. ^ Charles Léon Souvay, ed. (1910). "Idumea". Catholic Encyclopedia. New York: Robert Appleton Company. Retrieved 8 December 2015. ^ "Edom". Encyclopædia Britannica. Retrieved 8 December 2015. ^ Redford, Egypt, Canaan and Israel in Ancient Times, Princeton Univ. Press, 1992. p.228, 318. ^ Smith, M.S. (2001). The Origins of Biblical Monotheism: Israel's Polytheistic Background and the Ugaritic Texts. Oxford University Press, USA. p. 145. ISBN 9780195134803. Retrieved 2015-09-10. ^ "Herod | Biography & Facts". Encyclopedia Britannica. Retrieved 2018-10-13. ^ Retso, Jan (2013-07-04). The Arabs in Antiquity: Their History from the Assyrians to the Umayyads. Routledge. ISBN 9781136872891. ^ Chancey, Mark A. (2002-05-23). The Myth of a Gentile Galilee. Cambridge University Press. ISBN 9781139434652. ^ Shahid, Irfan; Shahîd, Irfan (1984). Rome and the Arabs: A Prolegomenon to the Study of Byzantium and the Arabs. Dumbarton Oaks. ISBN 9780884021155. ^ Genesis 36:33; Isaiah 34:6, Isaiah 63:1, et al. ^ Gordon, Bruce R. "Edom (Idumaea)". Regnal Chronologies. Retrieved 2006-08-04. ^ a b c Richard Gottheil, Max Seligsohn (1901-06-19). "Edom, Idumaea". The Jewish Encyclopedia. 3. Funk and Wagnalls. pp. 40–41. LCCN 16014703. Archived from the original on 2007-09-21. Retrieved 2005-07-25. ^ Isaiah 34:5–8; Jeremiah 49:7–22; Obadiah passim; for a possible treaty violation, see Jason C. Dykehouse, "An Historical Reconstruction of Edomite Treaty Betrayal in the Sixth Century BC. Based on Biblical, Epigraphic, and Archaeological Data" (Ph.D. diss., Baylor University, 2008). ^ M. Leuenberger (2017). "YHWH's Provenance from the South". In J. van Oorschot; M. Witte. The Origins of Yahwism. Berlin/Boston: Walter de Gruyter. ^ "Did the Edomite tribe Magdiel found Rome?". ^ Kings of Controversy Robert Draper National Geographic, December 2010. This article incorporates text from a publication now in the public domain: Singer, Isidore; et al., eds. (1901–1906). "Edom". The Jewish Encyclopedia. New York: Funk & Wagnalls. Wikimedia Commons has media related to Edom.